A young, female CIA officer under non-official cover has been snatched off of the streets of Beirut by Hezbollah. This is the kind of situation that CIA's legendary Deputy Director of Operations Edwin Rothmann needs solved fast—but he can't involve the agency. Instead, he enlists the renegade Ft. Lauderdale outfit he refers to as "CIA, Inc." headed by former CIA case officer Mac MacMurphy. As the kidnapped officer faces a battle of wits with her mysterious interrogator, MacMurphy and his team track down a former CIA asset who may hold the key to infiltrating the hostage situation before it gets out of hand. F. W. Rustmann, Jr. is a twenty-four year veteran of the CIA's Clandestine Service. He retired as a member of the Senior Intelligence Service (SIS) with an equivalent rank of Major General. He served in nine countries abroad on five continents, and in two of these assignments he was the senior intelligence officer in-country (Chief of Station). In one mid-career assignment he was selected to teach intelligence tradecraft to newly hired junior officer trainees at 'The Farm," the CIA's off-site covert training facility. Upon retirement from the CIA Rustmann founded CTC International Group, Inc., a pioneer provider of worldwide business intelligence. CTC's main clients are U.S. Fortune 1000 corporations and law firms with international operations. CTC is staffed primarily with former CIA intelligence officers and employs vetted correspondents in most major cities in the US and throughout the world. Rustmann has written numerous articles on the subjects of business intelligence, terrorism, the CIA, and doing business abroad. These articles have appeared in the Baltimore Sun, Palm Beach Post, Sun Sentinel, Newsmax, Time and the Miami Herald, as well as academic journals including those of The International Executive, The US Army Command and General Staff College and others. He is a recognized expert in the field of intelligence and business intelligence and has appeared as a guest on CNN, FOX, CBS, NBC, ABC and a number of TV and radio broadcast stations worldwide and locally, and is in great demand as a speaker at public events. He has been quoted frequently in the press including Time Magazine, The Huffington Post, USA Today, Newsmax, New York Daily News, Washington Times, Washington Post, Japan Times and the Far Eastern Economic Review, to name a few. He is a regular contributor to Newsmax Magazine and a frequent guest on Newsmax TV. Rustmann's first book on business intelligence, CIA, Inc.: Espionage and the Craft of Business Intelligence, was published in 2002 by Brassey's (now Potomac Books). Translations of CIA, Inc. have been published in Japan, Korea and China. He is also the author of two other espionage novels entitled The Case Officer and Plausible Denial. 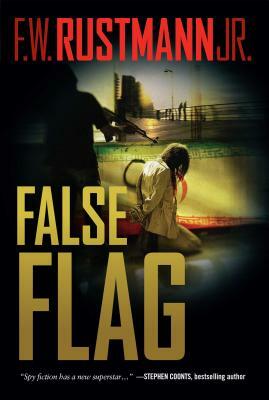 False Flag is the third book in the series, using many of the same characters.